I once saw a cat sit in front of a crack in a wall for 12 hours. We all thought she was insane, stricken by the sort of cat neurosis many house-bound felines develop over time. But kitty wasn’t crazy. She knew something we did not: That there was a rat in the wall, hidden between the plaster and the wooden beams. And she knew that sooner or later, the rat must emerge. I can think of no better example of the patience of a hunter. It is a patience able to withstand crushing boredom. It is allowing yourself to slip into a mental limbo somewhere between sleep and a spring. It is alert relaxation. At any moment, that rat may emerge and you have but a moment to strike. If you miss, you will never get those 12 hours back. Sturgeon fishing is like this. Let me preface my story by stating that I do not fish for sturgeon a lot. A couple times a year is about all I can manage. But I dearly love to eat sturgeon, and I often daydream about catching the El Dorado of sturgeondom, a female fish stuffed with caviar. It will happen. Someday. So I seek them when I can. My quest began back when I first moved here to California. I’d heard there were sturgeon here, and I wanted to catch one. I’d already been bitten by the sturgeon bug after an unsuccessful attempt to catch one up on Canada’s border with Minnesota the previous year. But the word in California was that the rivers were paved with gigantic white sturgeon, some more than 10 feet long. So I booked a trip with a few friends with high hopes. Maybe we’d all catch a keeper. It could be epic. Looking back on it I laugh at how naive I was. We most definitely did not all catch a keeper. For hour after hour we sat there at anchor in the backwaters of the great Sacramento-San Joaquin Delta, waiting. Like the cat. The captain had set the rods on sensitive balance rods, so the slightest nibble would be enough to tip the balance off and alert us to a possible bite. More than five hours into the trip, everyone else was asleep or comatose. Everyone but me. I’ve been fishing my whole life and I know what big game fishing can be like. Long waits are the norm. But catching a sturgeon is not like catching a shark. There is never any doubt when a mako hits the bait. Sturgeon, on the other hand, are one of the softest biters I’ve ever encountered; the only fish close is a winter flounder, and they weigh a couple pounds. Sturgeon can weigh more than 500 pounds. Very gently, one rod tipped downward and clattered on the rail. In an instant I had the rod in my hand. I wrenched the rod back to set the hook hard. Nine times out of 10 you wind up staggering backward because there was nothing on the other end of the line. This time there was weight. And I brought that fish to the boat. 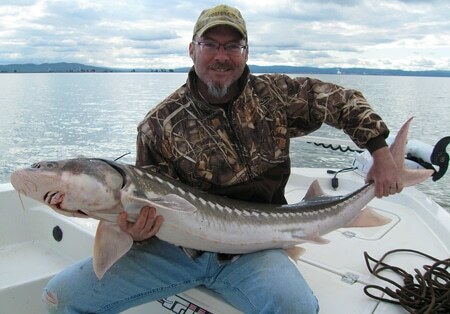 On my first sturgeon trip in California, I’d caught myself a gigantic keeper. State law was about to shorten the size limit from 72 inches to 66 inches, and here I’d caught a 70-inch fish. I was on top of the world, and I told all my fishing friends about it, expecting to get a hearty round of attaboys. Instead I got stink eye and grumbling. One of my friends said he’d been fishing for sturgeon, off and on, for five years and he’d never caught a legal fish. I heard “beginner’s luck” a lot. I thought it was all a lot of sour grapes. I had no idea. I caught that first sturgeon in 2005. Since then, at least twice a year and sometimes more, I’ve spent a day staring at the end of a rod, hoping — aching — for it to twitch. In vain. In nearly seven years of trying, I caught one undersized sturgeon. Does the cat staring at the crack in the wall hope? Or is it compelled to wait because that’s what cats do. I suspect it is the latter. year after year, hope drained away from me, replaced instead by an obsessive compulsion. Fishing for sturgeon became something I felt compelled to do. Once duck season ended, I felt drawn to the water for a day of staring at the end of a rod. So unlike my first sturgeon trip, I boarded my friend R.J. Waldron’s boat last week with no hope, only a cold drive that says I ought to put in yet another day of fruitlessness. I brought plenty of coffee. We motored out to Grizzly Bay, just a couple miles from the legendary Carquinez Straits. This is where, in July 1983, Joey Pallotta caught a 460-pound sturgeon that was more than nine feet long. Fish even larger have been released. R.J.’s friend Don was along with us. He was in a similar slump, having never caught a legal sturgeon. Don was hopeful. I felt nothing. An hour or so later, each of us were in vapor lock, staring at the rods. I imagined that I could see what was happening on the bottom, where my grass shrimp and chunk of lamprey were bouncing around. R.J. whipped a rod back, startling me. “Take it!” he shouted. I did. Fighting a sturgeon is like fighting a giant catfish — if that catfish and a largemouth bass or tarpon had a love child. Sturgeon can jump completely out of the water, or they can simply swim off willfully, unconcerned. That’s what my fish was doing. Here we go, I thought. Be patient. Be disciplined. Sturgeon snap lines when an angler gets too antsy. 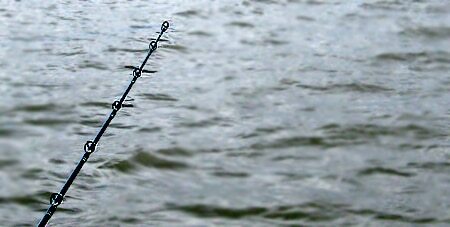 Few rods can muscle in a sturgeon before it’s good and ready. Reel down slack, lift rod. Reel down slack, lift rod. Gain line. The fish rolled on the surface. “A keeper!” R.J. shouted. I pretended nonchalance. I’ve been burned before. But for the first time in years, hope began to rise with every foot of line I gained back from this fish. Be patient. Be disciplined. The fish saw the boat, and just like a catfish, it freaked out. I lost every bit of line I’d just gained. There is nothing you can do but let a sturgeon run when they do this. You hold on and hope you can stop or turn him before you get spooled. A hundred yards, and the fish tired. Reel down slack, lift rod. I don’t know how long we danced like this, but it felt like an hour; it was probably more like 15 minutes. Finally I got the sturgeon to the side of the boat, and it was absolutely a keeper. For the first time I felt nervous. The rat had emerged from the crack. But just like the last time, the fish saw the boat and tore off line to escape. Five times this happened before the sturgeon tired. My heart stopped as R.J. plunged a gigantic net under the fish. This is another moment when sturgeon escape. I felt my line go slack, but up went the fish, over the rail and into the boat. At last! At last! We measured it: 55 inches long. At that length, the sturgeon was easily 50 pounds and probably 16 years old. Joey Pallotta’s record sturgeon was estimated to have lived a century. Sturgeon are the trees of the fish world. Ancient, slow-growing, relaxed and methodical in their ways. I admit I felt a twinge of guilt. This was no rat I’d caught, this was a tree I’d felled. I am glad that the state of California now forbids us from taking more than three of these great fish every year. Three trees are enough for any man to fell in a year. But I did not let this fish go. No, this sturgeon would feed us for many, many meals. And at the first of those meals, which I will describe later, we raised a glass to this mighty fish. Sturgeon as a species have taught me humility. This sturgeon taught me to never lose hope. Keep staring at the crack. The rat must emerge. Found you! A man after my own heart. Great post, great blog. I’m with all the others complimenting the writing on this one. Great story. Great hunt. That’s a gigantic sturgeon. Nice story by the way. I’m just getting into fishing the SF Bay and your story inspires me! Here’s to hoping I land my first sturgeon out this season.